Despite our low crime rates and stunning scenery for which Canada is famed, it seems we are a nation of stressed people. According to a 2010 Statistics Canada report 23.5 per cent of all Canadians aged 15 and older reported most days were ‘extremely or quite a bit stressful’, while those aged 35-54 reported the highest rates. In another study, 35 per cent of people responding to a 2011 Sanofi Aventis Canada Healthcare survey said that workplace stress had been so overwhelming that they’d been physically ill in the last 12 months. So why are we so stressed? Of course some people are more prone to stress than others, while family problems and workplace bullying can be a factor for others. But for most people worrying about their finances is the biggest cause of stress. Whether it is fear of losing their job in the continuing uncertain economic climate or keeping a business afloat, stress over money is a major factor in many people’s lives. But it is not just worrying about their financial situation today that has many Canadians stressed. A report released last year found that 60 per cent of respondents were anxious about coming up with the money to meet the annual RRSP deadline. And while the Bank of Montreal study found that 54 per cent of people surveyed would feel less stressed it they made regular contributions throughout the year, 49 per cent of respondents said they make their annual RRSP contribution in a lump sum. Clearly being better at managing everyday finances would help a lot of us feel less stressed, but with unexpected emergencies, low wages and rising living costs this is not always that easy. While everyone has different financial problems causing their stress, there are a lot of common financial issues that most people find stressful. If you are a business owner it is important to seek good financial advice, have a thorough business plan and a contingency plan in case your business experiences a sudden loss in revenue. For many, it is the first year of starting their business that is the most stressful time, and this is often the time when most businesses fail. It is important to be prepared to not earn an income in the first few months of trading, as often you will just break-even if you’re lucky. The majority of businesses, whether they are just starting out or are have been established for years, need to borrow money. If you’re just launching your business the Canadian Government is keen to encourage entrepreneurship so it is worth checking out the government website to see if you’re entitled to any grants or loans. When borrowing money for your business it is important to keep these loans and credit separated from your personal finance, that way if your business does fail you won’t have the added stress of losing your personal property as well. With the deadline date for tax returns fast approaching, this is the time of year many Canadians begin stressing about getting their forms back on time. While the organised amongst us get their tax information prepared in advanced and have no hassle filling in their form and sending it off well within the deadline, for most tax returns are another stress to their everyday life. For many people the reason for tax return stress is not having enough knowledge about what can be claimed on their tax returns. According to a survey carried out by Leger Marketing for H&R Block Canada in 2011, less than 25 per cent of people questioned gave the correct answers when questioned about their tax returns. The survey also found: – 82 per cent of Canadians do not know how much a $1,000 RRSP contribution would save them in federal tax, assuming a taxable income of $50,000 – Six out of 10 Canadians with children in the household are unaware that the lower-income spouse claims the childcare expenses – 40 per cent of married or common-law Canadians do not realize that they each need to file their own return, with the other spouse’s information included – Only a quarter of Canadians answered correctly that they should file an Alberta return if they move from Ontario to Alberta in June 2010 to take a new job – Three in four Canadians with children in the household do not realize that they are not entitled to claim any tuition or education credits unless their child transfers them – Only 27 per cent of Canadians correctly said that healthcare premiums paid to the group plan at work are a medical expense To avoid last minute tax return stress you should ensure that you are fully clued up on what you need to know to fill in your forms efficiently. It is also a good idea to plan for your tax returns throughout the year. Keep receipt and other information you’ll need in a specific folder, that way you’ll have everything you need in one place ready for when the next tax return deadline approaches. Learning to managing money is essential to reducing financial stress. For business owners managing their money is vital to whether or not their business will be a success or fail, while for homeowners being good at creating monthly budgets will help to ease the financial stress. The key to budgeting well is to be completely honest with yourself about how much you spend and on what, while also keeping track of how much you have coming in every month. The benefits to doing this is that it will allow you to see exactly what you spend and where, plus it lets you know whether you have a little extra each month or if you’re going to have to tighten your financial belt for a while. When you first start doing this it may seem like an added hassle to your already busy schedule, but in the long-run it will be a huge step towards taking control of your personal finances and, as such, will help to reduce your financial stress. Most of us need to borrow money from time to time, even if it is just to pay for unexpected emergencies, but being in long-term debt can cause stress. For many have a large outstanding debt that seems almost impossible to clear feels like a constant weight hanging over their head, and for many knowing any change in their circumstances, for example being made redundant or not being able to work through long-term illness, can mean defaulting on the debt. An article in The Huffington Post last year reported that 25 per cent of respondents to a Harris/Decima survey, conducted by bankruptcy trustees Hoyes, Michalos & Associates, said they will carry their existing credit card debt for more than a year, while some don’t know if they will ever repay the debt. 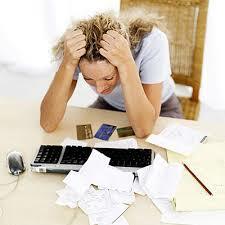 Credit card debt not only causes stress, but can also lead to further financial trouble including bankruptcy. The article also highlights a 2011 study that found the average bankrupt Canadian owes about $24,400 and owed money on four or more credit cards. Payday loans are a great alternative to those needing to borrow a small sum to make it to the end of the month, and because you have to repay the loan on your next payday it means that you don’t have the worry of long-term debt. A payday loan is the ideal solution to sudden emergencies that you haven’t budgeted for, as they provide a quick and easy way to get that extra bit of money. 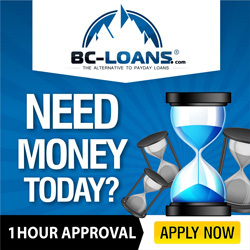 Also, unlike a bank loan or credit card, the criteria needed to successful get a payday loan are much more relaxed, again making the process faster and easier and ensuring you get the money you need when you need it. Another way to stop long-term debt from getting you stressed is to face up to your financial situation so that you’re able to deal with it. Calculate the total of all your debts and work into your monthly budget how much you can afford to pay back each month. Start with concentrating on the debt with the highest interest rate first and ensure you clear that one before moving onto other debts. Also prioritize the debts that could end up with you losing your possessions, for example your house or car, as if you don’t meet these payments it will cause added stress to you. Also if you are planning to borrow money from family members of friends think carefully about this before you do so. Borrowing from the bank of family or friends often causes no problems at all, however there are times when you’re unable to pay them back within the agreed time, which can cause arguments and discontent on both sides, sometimes resulting in long-term family feuds or the end of friendships. In 2012 a survey carried out by the Bank of Montreal found that 27 per cent of Canadians aged 18-35 had not started saving for retirement. On the plus side 52 per cent of people the Bank of Montreal questioned had a registered retirement savings plan and 36 per cent had a tax-free savings account. A different study carried out in the same year by CIBC found that although 47 per cent of people questioned had set up a TFSA account only half of those had actually contributed to it. These numbers are worrying because both these surveys found that less than half of Canadians have tax-free saving accounts, and fewer still are actually putting money into them. Why is saving so important to living a financially stress-free life? Simple, if you’ve got money saved for emergencies it means when the inevitable raining day happens, whether that is losing your job or simply needing some extra cash to fix your car, you’ve got the funds you need to cope. While clearing debts are more important than saving, have a savings account and a retirement fund in place will help to eradicate future financial stress. There are a lot of stresses in modern life, from work commitments to dealing with family problems. Many of these stressful situations are out of our control, after all we don’t have the authority to fire incompetent managers or the ability to control how other people behave or think, but we can control our finances. Although it is hard to live on limited means while the cost of living continues to rise, taking control of your finances will help you to look at how you can confront your debts and start paying them off along with knowing exactly how much you have to spend each month. Money might be the cause of most Canadians’ stress, but the reality is that it doesn’t have to be.